Diamond Dental, Wantirna takes good oral hygiene seriously, especially dental care at home. 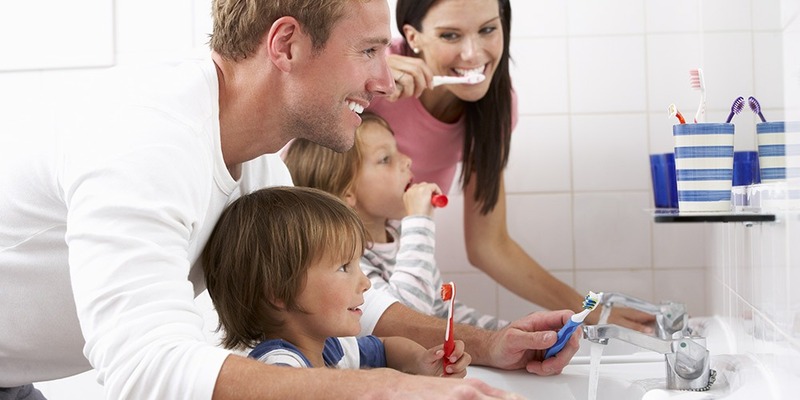 We believe good oral hygiene starts at home. If you didn’t take care of your teeth as a child, you may have serious dental troubles now, and you probably don’t even realize know without having had a dental checkup. It is important to start taking care of your teeth as young as you can. Start now! If you’re a parent, instill proper dental hygiene to your children. Nonetheless, the sooner you start your path to healthier dental hygiene the better. Dentists recommend brushing your teeth at least twice a day. However, good brushing technique plays a vital role. Aim the brush at the gum line and brush all sides of your teeth. Don’t forget the inner cheeks, and your tongue. This should take around 2 minutes. If you’re unsure of the correct way to brush, ask your dentist at your next checkup. Brushing removes food particles in the crevices between the teeth and gums. It also removes plaque that may cause tooth decay and gum disease. It’s doesn’t really matter which toothpaste you use. The brushing action is what cleans the teeth. It’s up to you whichever you prefer. As long as it has fluoride in it, it will make your dentist happy. Daily flossing is imperative to proper dental hygiene. Brushing alone doesn’t remove food particles stuck in between teeth. It’s like washing your hands, but never cleaning between your fingers. Only half of the job is done if you forget to floss! Correct flossing involves running the floss down each side of the tooth and is best done once a day. If you start flossing and your gums bleed, this is not uncommon. It is a sign of inflammation of the gums. The best thing to do is keep flossing and you will find, within a week your gums will be healthy and the bleeding will stop. We all know that sweets aren’t good for you. Aside from all the other health benefits of reducing sugar in your diet, your teeth will love you for it! It doesn’t take long for the sugar to eat into the enamel of your teeth. Your teeth will then succumb to cavities, tooth decay, and gum disease. We understand that every now and then, we just have to have one little chocolate or lolly! To avoid any harm to your teeth rinse your mouth with water to dilute the sugar, but if you can brush, by all means get in there! Remember, dental care at home is important!. We all know drinking soda’s contain a LOT of sugar, but they are also quite acidic. This is basically a double threat! Not only do you have the sugar attacking the enamel of the teeth, but the acid causes the teeth to erode. It is best if you can avoid soda altogether, but if you MUST have it, then try drinking with a straw to avoid coming into contact with the teeth, and wash it down with a glass of water. Cracking and grinding ice cubes seem fun, but you can actually create tiny stress fractures on your molars by doing it. Avoid opening a bottle using your teeth or using your teeth to do anything other than eating normal foods. The stress fractures over time can worsen and cause your teeth to completely crack . Dental care at home can start while your child is an infant. Chat to one of our friendly dentists today or make a booking by clicking HERE. At Diamond Dental we provide high class dentistry in our state of the art facilities located in the peaceful surrounds of Wantirna South, near Knox City Shopping Centre. Our modern equipment combined with over 50 years experience results in high quality dentistry and a premium service for our patients.